You aren’t truly an astronomer if your work doesn’t involve dust at some point (and I don’t mean the dust on our desks!) Dust grains are literally everywhere in space. They play an important role when we take pictures of the infant Universe, in the births of stars and planets, and in modifying the light we see from far-away galaxies. Mainly composed of carbon and silicon, interstellar dust grains are believed to be created in stars and in supernova explosions. Understanding dust isn’t an easy task because of it is interwoven with astronomy on so many levels. For example, the formation and destruction of dust grains connect with the physics and chemistry of the gas – dust grains absorb UV light which would otherwise break apart gas molecules or ionize atoms, while molecular hydrogen mainly forms on the surface of dust grains. At the same time, gas and dust do not move together in space. Today’s paper is part of an international collaboration known as the SImulating the Life Cycle of molecular Clouds (SILCC) project. The goals of this project are to provide a self-consistent picture of how molecular clouds are formed and destroyed, how stars are born within them, and how galactic outflows are driven. Since dust is important in every step of this endeavor, understanding the life cycles of dust grains is essential. The authors model the lives of dust grains inside the interstellar medium using a 0.5×0.5×2.5 kpc simulation box. Given that the typical sizes of disk galaxies are tens of kpc, they are concerned with the interstellar medium at the galactic scale. 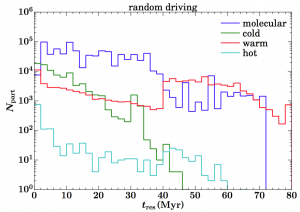 (As an aside: pc-, kpc-, and Mpc-scale roughly correspond to the size of molecular clouds, galaxies, and galaxies clusters; a good rule of thumb to remember.) Indeed, you can think of the simulations as dissecting a segment of a disk galaxy. Let’s take a look at a movie from the paper and I will explain what’s happening. The simulations start with a slab of gas uniformly distributed in the x–y plane (left panel), with a Gaussian distribution in the z-direction (right panel). There are mainly two forces at work, gravity tends to attract gas towards the z=0 mid-plane, and supernova explosions1 tend to punch holes in the disk and drive outflow of gas. The grey dots are ‘tracer particles’ which serve to represent dust grains. They are only passively carried around by the gas flow. In the beginning, at 10 Myr, a large fraction of the tracers are unaffected. They are then completely mixed in space after 40 Myr, with most of them residing in dense regions by the end of the simulations at 80 Myr. One of the outstanding points of the paper is the multi-phase treatment of the interstellar gas. Gas is divided into molecular, cold, warm, and hot phases according to the local temperature. This is the first time we can measure the durations that dust grains spend in different gas phases and the transition rates between these phases from realistic simulations! Figure 1. 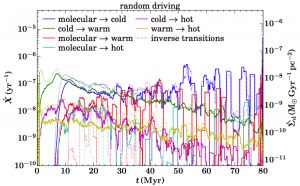 Time evolution of the transition rates between various gas phases. This is a busy plot with two main takeaways. First, the transition rates are highly intermittent. Second, the molecular-to-cold phase transition dominates (blue solid line). Figure 1 shows the seemingly complicated time evolution of the transition rates between different phases. There are mainly two takeaways from the plot with crucial implications. First, the transition rates are highly time-varying. Second, the molecular-to-cold-phase transition dominates. Earlier studies of gas-dust chemistry by other research groups mostly adopted transitions with constant rates, and with the molecular-to-cold-phase transition ignored in the calculations. The current work therefore highlights the inadequacy of the previous studies. Nevertheless, the mean transition rates measured in today’s simulations have similar orders of magnitude with previous studies. Figure 2. Histogram of the total residence time in different gas phases. The key message is that dust grains spend a broad range of time in different gas phases. The next important quantity is the time dust grains spend in different gas phases, known as the residence time. This is important because how dust grains grow or break apart depends critically on such durations. Figure 2 shows the histogram of the residence time dust grains have in different gas phases. The key observation from this plot is that the residence time in the molecular phase spans a wide range. This implies large variations in observed dust properties because individual dust grains effectively have different dynamical histories with the gas. This conclusion seems to be consistent with recent observations of grain size and gas-phase chemical abundance. As a part of the paper, the authors attempt an unconventional approach to define gas phases which makes use of the mass fractions of molecular/neutral/ionized hydrogen but not the traditional temperature cutoffs. They find non-trivial correspondence between the two, which further emphasizes the importance of the elaborate, multi-phase calculations. As noted by the authors, the current simulations do not include magnetic fields, self-consistent treatment of star formation, or other channels of stellar feedback except from supernovae. Future papers will definitely help refine our understanding of how gas, dust, and stars play as a team. 1Only the results of the “random” run is presented here, where the positions of supernova explosions are chosen randomly. The “peak” run places explosions at the peaks of gas density, and the “mixed” run put supernovae at random and at density peaks with 50:50 chance. The “random” run reported is believed to be the most realistic.